In Nature today an international team of researchers from TU Eindhoven, QuTech, TU Delft and the University of California – Santa Barbara presents an advanced quantum chip that will be able to provide definitive proof of the mysterious Majorana particles. These particles, first demonstrated in 2012, are their own antiparticle at one and the same time. 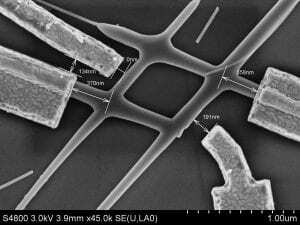 The chip, which comprises ultrathin networks of nanowires in the shape of ‘hashtags’, has all the qualities to allow Majorana particles to exchange places. This feature is regarded as the smoking gun for proving their existence and is a crucial step towards their use as a building block for future quantum computers. Sasa Gazibegovich1,2; Diana Car1,2; Hao Zhang2; Stijn Balk2; John Logan3; Michiel de Moor2; Maja Cassidy2; Rudi Schmits4; Di Xu2; Guanzhong Wang2; Peter Krogstrup5; Roy Op het Veld1,2; Kun Zuo2; Yoram Vos2; Jie Shen2; Daniël Bouman2; Borzoyeh Shojaei3; Daniel Pennachio3; Joon Sue Lee3; Petrus van Veldhoven1; Sebastian Koeling1; Marcel Verheijen1,6; Leo Kouwenhoven2,7; Chris Palmstrom3; Erik Bakkers1,2.